12 oz Kids Wide Mouth is rated 4.3 out of 5 by 41. Rated 5 out of 5 by MrsTate from Great for all kids! Bought the kids Hydro Flask because my 2.5yr old loves to drink out of mine. He is obsessed with his and now it’s all he will use! I guess I might need to buy more! Rated 5 out of 5 by rptapia1 from Hydration is key Great purchase for my kindergarten child. Her h20 I take has increased. Rated 5 out of 5 by Trout from Very useful I have a total of 4 hydros each is used for something different. I love being about to bring juice and such to school with me without ruining my 32oz bottle! Rated 5 out of 5 by Yianni19 from Definitely recommend to buy I bought this water bottle for my 8 1/2-year-old and he love that it is the most recommended water bottle I wrote this year. I definitely recommend this water bottle to parents that this will be the best water bottle for your child. Rated 5 out of 5 by steph55 from Amazing bottles My mom and I bought hydroflasks right after christmas and use them everyday. Yea they are a bit pricey but the quality is worth it! Rated 5 out of 5 by Watermelon20 from Pefect for Toddlers I bought myself a 32 hydro flask with the straw top. I had it for a week and my daughter loved having it with her. I decided to buy her mini and she carries it with her everywhere. Before we leave the house, she makes sure she has ice and water in it. Totally recommend it for parents and toddlers! Rated 5 out of 5 by YLMD from Kids love it The kids actually drink enough water now because the love the bottle. Rated 5 out of 5 by Gcdangelo from Well made! Great product! Awesome quality, and the kids love it! Rated 5 out of 5 by Danisher from Great kids water bottle Love our hydro flask. Easy to clean, durable and keeps things cool for hours. Rated 5 out of 5 by maize from Awesome for kids! This is the second kids flask that I purchased. Its super durable and I love the straw spout for kids. We take it everywhere. 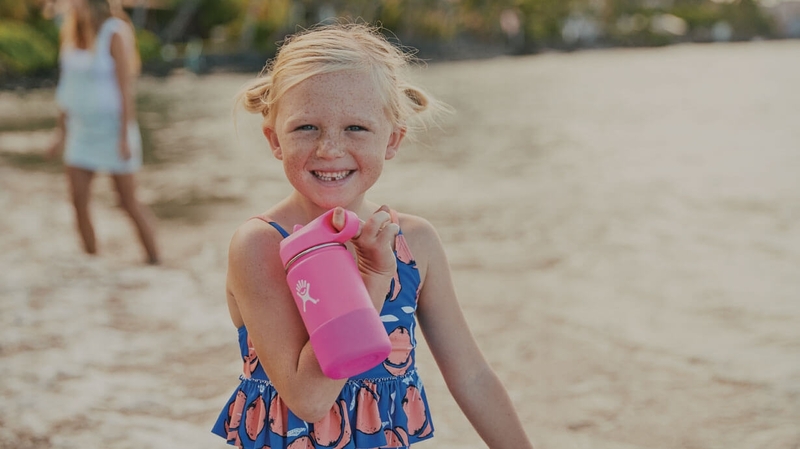 Rated 5 out of 5 by Wendy R from Great for kids My toddler loves having her own hydro flask it’s so easy to hold and travel with. Rated 5 out of 5 by Bexx from Perfect for my son Happy we purchased this for my son. He loves having a special cup. Keeps his water cold all day and very easy to clean. Rated 5 out of 5 by Ra Ra from Perfect for any age I bought mine (32 oz wide mouth) in November and LOVE IT. My 18 month old granddaughter loves it, too. She has to drink from my Hydro Flask (over her baby water bottle) whenever she comes to the house. Lol She loves it so much that I had to purchase one that’s just her size. Now we both have our own and we couldn’t be more impressed. Rated 5 out of 5 by Mmp5 from Great travel bottle I spent a really long time searching for the perfect water bottle for my 2 1/2 year-old, that would be good for traveling and when we are out. I’m so glad that I got this one! He absolutely loves it He can open and close it easily on his own and can comfortably hold it in his hands. Yes it may spill/leak a bit if turned over but he’s pretty careful and it really hasn’t been a problem at all. Rated 5 out of 5 by Happy parent from Kid friendly! Bought this for Christmas for our 6 year old—she loves that it doesn’t spill, the color, and it’s size. We love that she drinks about 5 bottles a day now! I do have a question though...is it dishwasher safe? Thanks! Rated 5 out of 5 by Banajana from No leaking if you don’t use the straw Excellent bottle. My 3 yr old loves it and we don’t use the straw at all. So far , no leaks. And we have been using it every day for over 6 months now. Do the bottle contain phthalates? No. Our bottles are made of Durable 18/8 Pro-Grade Stainless Steel construction and are BPA-Free, BPS free and Phthalate-Free. Does the lid come with the straws to cut or are they already cut to size? Can you purchase just the straws? The straws are one size so they need to be cut to fit the flask you have. The straws are not available to purchase, however, we can send a replacement cap that comes with two straws. Hi, are the kids water bottle leak proof? Thanks! What does the inside of the lid look like for cleaning purposes? How do you clean the inside of the mouth piece? This cap would be top rack dishwasher safe. You can also use a straw brush scrubber. No, our flasks are made in China. Do they leak when turned upside down? My boys are constantly making a mess with their current bottles because the water just runs out. Yes, they can leak if they are turned upside down. Are these spill proof lids? No the straw cap is not advertised as spill proof or leak proof.